The 337 Fixturing Head allows permanent fixturing for production line assembly or repetitive repair. Work can be bolted to this head easily because of its six slots and bolt holes. The flat round surface is 5 3/8" (136.5mm) in diameter. 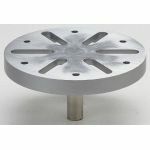 The steel stem is die cast into the aluminum head and is 2" (50.8mm) long and 5/8" (15.9mm) in diameter.